➢ “In the Canadian-set thriller, Tim Roth’s small-town police chief comes up against an almost comically evil oil company … Tin Star is odd, but intriguing. Having the cop protagonist be a recovering alcoholic is the oldest cliché in the book; but the fact he has an ominous reflection that doesn’t move when he does is definitely not … One thing’s for certain: the scene is set for revenge, recriminations and revelations after the enjoyably strange opening.” — The i. ➢ “Cinematically shot and twangingly soundtracked, Tin Star was a noirish thriller. Its backwoods setting and eccentric townsfolk would have rung bells for Fargo fans … Sky has splashed lots of cash on these international co-productions but have a modest hit rate … They’re over-hyped, overlong (Tin Star is another 10-parter) and ratings tail off rapidly. Can Tin Star fulfil the promise of this intriguing opener or will it go the same way as its stablemates?” — Daily Telegraph. ➢ “This has all the weird, sinister qualities of Fargo but with a vital extra ingredient: Tim Roth. Christina Hendricks is deftly cast as a ball-busting, oil-refinery big cheese. But it is the glimpses of Jim’s apparent dark alter ego that make this so thrillingly promising.” — The Times. 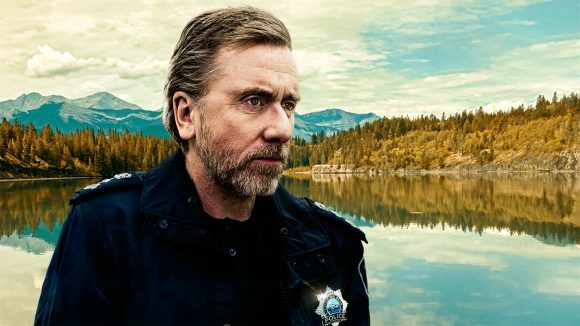 ➢ “The show is anchored by a superb performance from Tim Roth, who’s exactly what you’d hope from a swaggering British cop let loose in the Rockies. Straight-talking, sharp-tongued while fraught with a troubled past of alcohol addiction and suppressed alter-ego memories, he’s an enticing troubled, angry Brit who carries the show whenever he’s on-screen.” — Metro. ➢ “There’s some dramatic music, sweeping camera work and intense looks that suggest a dark, brooding drama is on the cards. But at the same time, the speed of the action and the number of bullets fired already suggests it could equally lurch off into a blood-fuelled old-style western. There’s enough there, anyway, to drag viewers back in for a second round. And a hat tip to Three … for spotting, buying and quickly airing what is shaping up to be a very decent drama right in the middle of primetime.” — Stuff.